What Role Does Ethnicity Play in Africa’s Elective Politics? The history of ethnicity and problems of tribalism in Africa cannot be discussed in isolation from the impact of slavery and slave trade as well as colonialism in the continent. These issues are closely intertwined. When the slave hunters invaded our continent from Europe in the 17th and 18th centuries, they not only wreaked havoc in the continent by seizing millions of the most productive sector of our population; young, healthy and strong men and women, they also created unprecedented divisions, suspicions and mistrust between our communities, thereby manipulating them in order to create conditions conducive to their interests. The slave dealers needed people to do their dirty job in the capturing of Africans to be shipped across the oceans to work the lands of America and elsewhere. These kinds of activities planted some of the seeds for conflict and mistrust among our people that persist to this day. Things got worse with the advent of colonialism. By its very nature, colonialism, just like slavery before it, was a system of divide, conquer and rule. The fundamental philosophy in both slavery and colonialism was to divide and segregate human beings by skin colour and race. Under this philosophy, the Caucasians were assumed to be the “superior” race and the Africans or the so-called Blacks were considered to be an “inferior” race at best. This racist notion informed everything the colonial administrations did in Africa, in Asia and in the Americas. At the top of the chain were the Caucasians who consisted mainly of the colonial administrators, the settlers, business people and missionaries. In the middle were the Asian communities mostly brought to Africa as indentured labour. And at the bottom were the indigenous communities whose job was to work the farms and provide for the comfort and wealth of the colonialists. All over the world, the colonialists segregated the indigenous communities by choosing what areas of work or profession the local people could be allowed in and what they were excluded from. For instance, they decided which communities would be recruited into the armed forces and the police force and which ones would work in their farms and their homes. The primary and sole purpose of members of the disciplined forces was to defend and protect the colonial interests. They also controlled who was allowed to open and operate business and in what parts of the country. All the artificial divisions of African communities into little silos within their own countries were meant to serve the political, military and economic interests of the colonial powers. They were also meant to breed mistrust and resentment between communities so as to make it harder for them to join forces to reclaim their countries or to liberate themselves. In Kenya, for example, with the emergence of the war for national independence, popularly known as the Mau Mau war for national liberation, the Gikuyu community who formed the bulk of that uprising were virtually separated from other Kenyans and mostly held in massive concentration camps very similar to the Nazi camps in Europe. Tens of thousands of Kenyans of Gikuyu nationality were rounded up from the urban centres and taken to those camps. These were very deliberate acts of division aimed at weakening communities so that they couldn’t unite for the common purpose of their liberation. I will come to the Kenyan case later. Bear in mind that colonialism was mid-wifed through the Berlin Conference of 1884 where the European powers basically sliced the African continent into spheres of influence primarily for Britain, Germany, France, Portugal and Belgium. The European powers drew borders arbitrarily with the sole aim being the preservation and protection of the colonial interests. Whole communities were simply chopped off and separated into different countries. It is not inconceivable that some people woke up and found half their homes were in one country and the other halves in another country. For example, in our region, a big chunk of the Somali people live in what remains of the country that used to be known as Somalia while another chunk of Somalis are in Kenya. They had no choice whether to be in Kenya or Somalia. The same case applies on the Maasai, Kuria, Luo, Luhyia and other communities who found themselves scattered in Uganda, Kenya, Tanzania, Ethiopia, the Democratic Republic of the Congo and Sudan. Thus we found elites with a common language and culture bandying together to form or belong to the same organization or party in order to compete for political power, primarily as a leverage for a share of the scarce resources. In addition, there is an understandable psychological association between certain ethnic groups and political parties in ethnically segmented nations in Africa. Hence, ethnicity has a direct and indirect impact on political behavior � positively and negatively. However, ethnicity as a political tool remains one of the daunting obstacles to the democratization enterprise in Africa. The civil wars in Nigeria, Rwanda, Uganda and Burundi, among others, can be attributed to the contest between ethnic groups over the control of the apparatus of state and government for the allocation of the national pie. The politicization of ethnicity all over the African continent has in turn generated deep-rooted suspicions, mistrust and at times resulted into widespread violence, insecurity and even caused genocide. Thus, many aspects of competitive politics in Africa are founded on ethnic politics based on who gets what, when, and how. Those are the roots of what has emerged as ethnic tensions and tribalism in Africa. While the struggles for national independence helped to bring a sense of nationhood in some countries, the people of the continent have had to contend with the artificial divisions discussed above, the mistrust and suspicions that came with them and were later re-enforced by political opportunism of African elites who took over from the colonialists. One of the countries that have been embroiled in the politics of ethnicity since independence is Nigeria. The politics of ethnicity in Africa’s most populous country took a serious turn following General Sani Abacha’s military coup of November 1993. Immediately following the coup, he announced he would establish a constitutional conference to work out the modality for Nigeria’s return to civilian rule. Almost immediately, various ethnic groups started coalescing and articulating strategies to influence the outcome of the convocation. Such ethnic groups as the Ijaws, Tivs, Igbos, Yorubas, Edos and Hausa-Fulanis presented their positions regarding the constitutional conference. The strategies of these ethnic groups were viewed to be instrumentalist. To this end, the contest related to the group that might become the custodian of the state and therefore be in a position to distribute scarce resources. Another country that experiences ethnicity in its electoral politics is Sierra Leone. Whereas the Creoles dominated the political landscape in pre-colonial Sierra Leone, it did not take long in the post-colonial era for the other major ethnic groups, Temes and Limbas, to discover the power of ethnic solidarity in the struggle for political power. The lesson to be learned in the Sierra Leonean situation, as is the case elsewhere in Africa, is that the group that controls political power also determines how the national resources are to be distributed. The linkage between competitive politics and the politicization of ethnic identities in Sierra Leone suggests, inter alia, that politics of ethnicity is primarily an instrumentalist phenomenon, its primordial underpinning notwithstanding. As an instrumentalist construct, the politics of ethnicity tends to collapse the distinction between ethnic identity, on one hand, and political choices, affiliations and loyalties, on the other. In the case of Sierra Leone, following the peripheralization and marginalization of the hitherto dominant Creoles in the internal politics, the final battle for the control of resources was to be waged between the Mendes and Temnes. In the political duel, Mendes (under the banner of the Sierra Leone People’s Party) had to lock horns with the Temnes (under the aegis of the All People’s Congress) for control of the apparatus of government. In Rwanda and Burundi, the problem of bad governance as manifested in preferential treatment of the Tutsi by the colonial authorities was largely responsible for politicization of Hutu ethnicity, which culminated, in the case of Rwanda, in an anti-Tutsi movement from the early 1950s climaxing in the so-called Hutu revolution of 1959, a revolution which was preceded by massive propaganda against the Tutsi spearheaded by political elites who were positioning themselves to take over power in anticipation of the exit of the colonial power. As fate would have it, the Tutsi nationalist leader at the time, Rudahigwa, was working closely with Patrick Lumumba in the Congo against Belgian colonialism in the two countries. His Hutu and Belgian detractors later accused him of wanting to turn Rwanda into a communist state. This convenient convergence of interests of the Hutu and the Belgians (missionaries and colonial administrators) would tip the balance of support in favor of the Hutu, who would thereafter receive constant support in their campaigns against the Tutsi culminating into the Hutu revolution and the overthrow of the Tutsi King. This marked the beginning of what has become a permanent ethnic conflict between two groups that before colonialism co-existed relatively peacefully as a common linguistic community. Essentially, the Hutu and Tutsi belong to the same “ethnic” group. In other words, they have a common culture and language. Yet, ironically, the colonial powers were able to cause divisions amongst them through arbitrary and artificial stratifications using height, colour and anatomical features. The fear of a possible return of the Tutsi to power would make the Hutus to put in place structures and processes of governance that ensured the hegemony of the Hutu in every field of human endeavor, and thus put the two “ethnic” groups on a permanent collision course. Similarly, in Burundi where the Tutsi had also been the ruling minority before and during colonialism, tensions began to emerge in the terminal years of colonial rule as a result of a spill-over effect from Rwanda. To ensure that they did not face a similar fate, the Burundi Tutsi reinforced their authority through the establishment of a security infrastructure that often preempted any dissent among the Hutu community. But with the formation at independence of ethnic political parties and movements, the stage had been set for what would also become a permanent crisis in the body politic of the state. The Tutsi, as before, continued to dominate the security agencies, key positions in the government and in the state-controlled sector of the economy. The increased marginalization of the Hutu would result in the creation of a paramilitary ethnic movement, which over the years has been responsible for intermittent harassment of the state security agencies and the Tutsi population at large. In the neighboring Democratic Republic of Congo, formerly Zaire, ethnic tensions also characterized socio-political relationships, especially in the later phase of colonialism. By the time of independence, politicization of ethnicity was an accomplished mission. Ethnicity in DRC was indisputably highly politicized at the time of independence. The politicization of ethnicity would result in the formation of ethnic political parties by the various ethnic groups (the Bakongo, the Luba-Kasai etc. ), some of which had been fostered by the former colonial masters on the eve of independence. It is these political formations that would introduce a conflictual relationship in the body politic of the Congo. The emergence of regional/ethnic-based political parties was largely facilitated by the absence of a national elite that could spearhead the formation of nationalist parties on the eve of independence. This was largely because no such elite existed as a result of the retrogressive socio-economic policies pursued by the Belgians. Whereas in the case of Rwanda and Burundi such an elite had emerged at the time of independence because of the case of communication facilitated by the small territorial sizes of the two countries, the same was not possible in Zaire because of its large geographical size and lack of communication, which is why political parties, when they did emerge, could not escape the tag of regional parties, for they lacked a national consciousness to link them to the centre. The conflict following the attainment of independence and the assassination of Lumumba naturally took an ethnic coloration. The dominant modes of ethnicity underwent a further transformation under the Mobutu regime, where centralization and elimination of opponents greatly reduced the visibility of ethnicity. But with the collapse of global communism and the emergence of the ideology of good governance as a determining factor in the relationship between Western donors and the developing countries, which had hitherto survived on an authoritarian mode of governance, the likes of Mobutu at once became irrelevant and this would open up opportunities for internal agitation for change. And when this opportunity arose, ethnic ideologies that had been suppressed over the years re-emerged and became the basis upon which the fight against the Mobutu regime was waged. This explains why the various groups that tried to come together in the early 1990s under the umbrella of a national constitutional process would end up in disarray, before the Kabila forces capitalized on the deteriorating situation in the country to seize power in Kinshasa. The irony, however, is that the removal of Mobutu from power compounded the conflictual ethnic situation, rather than removing it. Power at the centre became a contested commodity by ethno-regional leaders, a situation that sooner or later precipitated separatist movements reminiscent of the crisis in the early 1960s, following the abrupt granting of independence to the country by the Belgians. It is this fragmentation within the country along ethnic lines and the accompanying anarchy after the collapse of the Mobutu regime that had the effect of spilling over to the neighbouring countries, notably Rwanda, Burundi and Uganda, and which provided a convenient justification for these three countries to intervene in the Congolese internal affairs under the pretext of protecting their own territorial borders from external encroachment. The intervention by these three countries in the internal affairs of the DRC would have the effect of emboldening the various antagonistic ethnic groups, as each found itself operating under the military umbrella of Rwanda, Burundi or Uganda. The mysterious circumstances under which President Laurent Kabila was assassinated demonstrated the extent to which the situation had got out of hand. The Cameroon case is a unique one from the perspective of its tripartite characteristic � that is, Anglophile, Francophile, and indigenous complexions. In addition to the problematic marriage of French and English traditions in this multi-ethnic and multilingual state, political competition for power tends to sharpen the ethnic walls, interests, and differences. In the drive to amalgamate the two major blocs in the Cameroonian polity, the late President Amadou Ahidjo opted for a great single unifying political party. In such a party, contended Ahidjo, democracy and freedom of speech would blossom and reign supreme, while simultaneously allowing contradictory tendencies and constructive criticisms to flourish within the party as part of the hallmark of a truly democratic society. The one-party system mollified the threat to national unity and debarred the proliferation of ethnic political parties. But despite more than three decades of one-party rule, not much changed to promote the spirit of nationhood that overrode or superseded ethnic and regional identities. The political space enlargement in 1990 by the Paul Biya administration literally opened up the initially latent fissures in society. The liberalization of the political system in the wake of the political and economic pressures brought to bear on the system by international lending organizations led to the formation of political parties in 1992 for the multiparty legislative and presidential elections. In this arrangement, the following parties were formed along ethnic and regional lines: Cameroon People’s Democratic Movement, with its support among the Beti-Pahouin collectivity in the center, south, and east provinces; the National Union for Progress and Democracy, Foulbe and northern-Moslem dominated; and the Social Democratic Front, Bamileke, Anglophone of the west province. The Union des Populations du Cameroun garnered its support from the Bassas in the littoral and west province, while the Movement for Defense of the Republic drew its support from the Kirdi ethnic group in the far north province. The formation of these ethno-regional parties was not intended to further democracy per se. Rather, they were created for the control of political power and scarce resources. In my country Kenya as I mentioned before, the Gikuyu community were at the heart of the national resistance. Kenyans took arms in the early 1950s to fight for their land and for their freedom. In fact, Kenya’s war for national independence was the harbinger for many such activities in the continent and elsewhere. The Mau Mau war of liberation was fiercely fought in Central Kenya which became a complete war zone between 1952 and 1957. In reality, the whole country was on a war footing and Kenyans were involved in many different ways. Dedan Kimathi, one of the most celebrated Kenyan heroes led the freedom fighters until he was captured in 1956. One of the most interesting phenomena of the Kenyan war for national independence is that it united the country. There was no part of the country where the colonial government was accepted. Kenyans, regardless of their ethnicity and tribe, were convinced they had to remove the British from the seat of power. One only has to recall the humiliation, exploitation and violence of colonialism against all Kenyans to understand why people were so eager to put an end to colonialism. It was unbearable and remains one of the worst crimes against humanity just like slavery and slave trade before it. The best lands in the country were seized by the colonial powers and given to settlers. African land owners became squatters working for the colonial farmers. People were treated like animals. They were made to work long hours without adequate remuneration; barely getting enough to feed their families. They had to use something called Kipande and/or Pass without which you were non-existent. People were lined up and caned by arrogant colonial administrators when they felt the locals were not respectful enough or sometimes just for entertainment. This is what drove Kenyans into embracing the ideals of Mau Mau and the war for independence. Even though the colonial powers in Kenya prohibited national organizations, Kenyans still used their regional parties to fight for the same objectives of freeing the country from colonial rule. The independence political parties in Kenya, the Kenya African Nation Union (Kanu) and the Kenya African Democratic Union (Kadu), were formed in response to the colonial policy of sanctioning only district parties, which were mainly ethnic “coalitions.” The district in most cases coincided with an ethnic group and hence the creation of ethnic parties between 1955 and 1959. These included, for example, the Abaluhya Political Union, the Kalenjin Alliance and the Maasai United Front. When the ban on territorial associations was lifted, the district political associations merged and joined either Kanu or Kadu. Kanu revolved around the majority tribes (Luo and Kikuyu), while Kadu revolved around the minority tribes (predominantly based in the Rift Valley (the Kalenjin, Maasai, Turkana, Samburu) but also included the Luhya of Western Kenya and the Coastal ethnic groups. In 1963 when Kenya achieved independence and the Union Jack was lowered and our national flag raised, the whole country celebrated. It was probably the happiest day in the history of our country. The government that emerged led by Mzee Jomo Kenyatta and my father, the late Jaramogi Oginga Odinga had a cabinet that reflected the diversity of the whole nation. Kenyans were united as never before and one can say that we had really come together as a country. What followed is actually a good example of how African elites who took power after our liberation struggles resorted to fuelling ethnic hatred and manipulation to divide communities; not for the benefit of those communities, but for the elites themselves to grab wealth and hang on to power by all means. In many African countries, what emerged after independence was the life president syndrome. The post-independent Big Men did not want to leave power until that giant of a man, Nelson Mandela, came into the scene and showed them the way. This is really the second rise of ethnic tensions in Africa which was mainly propped up by greedy and power hungry African leaders who realized their best chance to stay in power was to incite communities against each other. The standard trick has been that these leaders, while looting public resources and amassing obscene amounts of wealth for themselves often go to their ethnic communities and feed them with a falsehood that it is time for their community to eat. However, the sad reality is that while the leaders get wealthy by grabbing land, houses and minerals like in the case of Mobutu, most members of their ethnic groups have nothing to show but somehow believe that somewhere down the line the wealth will trickle down to them. The result in all of Africa and more so in a place like Kenya has been the emergence of toxic tribalism and negative politics of ethnicity. The communities that are being lied to that it is their time to eat become very hostile to other communities whom they feel want to take the food from their table, and the communities that are out of power also feel hostile to those in power, seeking to get their chance to “eat.” It is a vicious circle. The tragedy of it all is that, in reality, only the elites are benefiting and the people they are setting in conflict against each other are in the same boat. During Kenyatta’s reign, many people from his community lived in squalor in urban centres, barely able to feed themselves just like the people from other communities. Poverty in Kenya does not discriminate on the basis of tribe and yet tribalism is ripe everywhere. In away, we can say that in Africa, the first major contributor to the politics of ethnicity were the first generation of African leaders. Yes, we have had some heroic leaders in the continent with visions of a united and prosperous Africa; but Africa has had more than its fair share of mediocre leaders who were presented with historic opportunities to unite our people but instead chose to serve their individual interests and used ethnicity and tribalism for their selfish agenda. It is a great shame for our continent. What happened in Kenya is that by 1966, only three short years after independence, the country was already divided in two camps. The nationalist camp that wanted more equitable distribution of resources was pushed out of government and soon even their opposition party Kenya People’s Union (K.P.U.) was outlawed and leaders including some who had been detained with Kenyatta during the colonial era, were arrested and detained without trial for many years. Tribalism had become a form of undeclared state religion and things like tribal oathing became common practice. The instruments of the state had been hijacked by tribal interests and by 1982, legislation was enacted to make Kenya a one party state. The interesting thing is that just like during colonialism, again it is state repression in the 1980s and 1990s that brought the communities in Kenya together. As our jails and detention centres were getting filled with Kenyans from all nationalities, people began to realize they had to fight as a nation not us tribes to achieve positive change for the country. Once again we saw the emergence of national anti-government movements like the Forum for the Restoration of Democracy (FORD) whose agenda was to salvage the country from one man dictatorship. 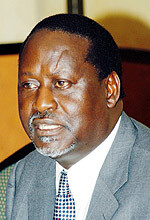 After 20 years of struggle that took many turns and twists, the Kenyan people emerged victorious in 2002 when the opposition parties joined hands and formed the National Rainbow Alliance Coalition (Narc), which became one of the few movements in Africa to remove a sitting president from power through the ballot. It was a remarkable feat that shook the whole continent. Kenyans across the country were ecstatic. It was a genuine sense of national accomplishment as the country watched retired President Daniel Arap Moi hand over power to our current President Mwai Kibaki. Once again, our political leadership had a historic gift from Kenyans and a great opportunity to unite the country and build the Kenyan nation free from the vestiges of tribalism and ethnic intolerance. They had a chance to put an end to the politics of ethnicity and introduce issue based politics. Sadly, our present leadership has not lived up to that expectation and as I speak here today, we are all aware that tribalism has become a major problem in the country, and the politics of ethnicity a vibrant vehicle being manipulated by backward forces that do not want positive change. The good news is that it is practically those kinds of conditions that often force Kenyans to think beyond the tribe and unite and as a person actively involved in Kenyan politics. And as someone who has traveled to every part and corner of our lovely country, I can tell you that there is an overwhelming feeling among the majority of Kenyans that we have had enough of tribal games being played by leaders and the people now want real change, which the Orange Democratic Movement, is offering. My point here is that the real culprits in the emergence of tribalism and the politics of ethnicity as a negative force in the continent in the post independence era has been the selfish leaders and never the people themselves. That is what is encouraging. We know that with visionary leadership that transcends tribal manipulations our countries are capable of making great strides. The continent is actively moving towards regional integration and pulling the nations together to mobilize its immense resources for the good of the African peoples. In that regard, we have to take full advantage of our common cultural links and heritage with our African American brothers and sisters as well as other Africans in the Diaspora. We need to exploit further our common interests as a people and translate them into investment opportunities, cultural exchange programs across the continents of America, Europe and Africa, and promote meaningful, structured and mutually beneficial ventures across the oceans that artificially divide our people. In conclusion, let me say that the politics of ethnicity has been the dominant determining factor in electioneering at the national level in Africa. Individuals and groups have been mobilized on the basis of a common culture and a common language, as well as the habitation of a common territory. At the local level, however, factors prevalent during the one-party era have remained pertinent, that is, clan lineage, individual leadership qualities, development record and the dominant party. The bottom line is that, at the local level, ethnicity ends up being conflated with other factors that are pertinent to the local populace. Furthermore, at the local level, there is a shift from the inter ethnic to an intra-ethnic competition. To curb the anomaly of ethnicity in electoral politics, Africans must start holding their leaders to account by insisting on the creation of viable political parties that prioritize issues and policy programs that address the problems of the people at the expense of identity. This will need efforts from both the populace and the leadership. As well, we must create institutional structures that will allocate and ensure the sharing of resources equitably. When this happens, it would not matter who becomes president or Prime Minister. The people deserve and expect equal share of resources, jobs and infrastructural development without any regard to their race, ethnicity, gender or religion. As I offer myself for the presidency of Kenya on the Orange Democratic Movement ticket, I promise to lead in this direction and follow in the footprints of Nkrumah, Nyerere and Mandela, who not only had a vision for their respective united countries but also had the dream of one day having in place a united Africa along Pan-Africanist principles. This entry was posted on September 12, 2007 at 11:11 45	and is filed under AA > News and News analysis. You can follow any responses to this entry through the RSS 2.0 feed. You can leave a response, or trackback from your own site.